Resin drying capability eliminates the need to purchase material pre-dried in sealed boxes and allows bulk purchase of raw materials. Resin drying at the extruder assures the lowest moisture levels in the material possible, thereby improving quality and reducing process problems and instability. Dehumidifying systems should be designed and specified for energy efficiency, since these systems consume a considerable amount of electricity. In-house crystallizing capabilities for PET converters adds a high level of flexibility allowing the use of amorphous materials and regrind. Lower resin costs and improved material dryness and product quality. Lower energy usage and cost. Lower resin cost and handling expense. 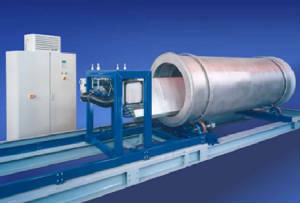 Conair Gas Fired Dehumidifier - 2000 CFM, with 7-1/2" diameter process connections. Model HBG2000 with Compu-Dry controls. Novatec Dehumidifier - Rated up to 3000 PPH and includes blending & conveying system and drying hopper. Model MPC-3000, with MCD-1002 microprocessor controller. Una-Dyn Dehumidifier - Designed for 2500 PPH on PET and includes 15,000 pound drying hopper. Model DHD120. Please respond below for a detailed quote, or give us your specific needs, and we will find the right dryer for you. All systems are subject to prior sale.